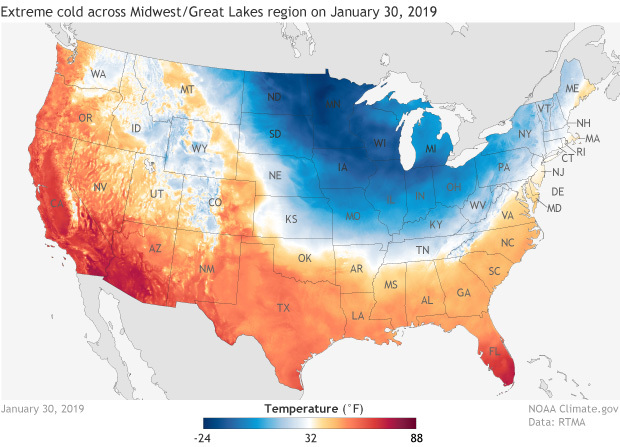 Daytime high temperature on January 30, 2019, based on NOAA Real-Time Mesoscale Analysis data. An analysis is a blend of observations and model output that is used as the "initial conditions" of the atmosphere for a given forecast period. Map by NOAA Climate.gov, based on RTMA data provided by Steve Levine/NCEP. In a gridded data set, the globe is divided into hundreds of small squares of comparable area, called "grids," and a sophisticated computer program averages and interpolates data from all nearby stations to come up with a best estimate of the temperature in each grid. This allows us to characterize the spatial extent of warm and cold records and how they are changing over time in a more objective way. Some preliminary results from the CPO-funded research project, based on analyses of 1951-2017, are presented below. Looking at monthly temperature records from the gridded version of the NOAAGlobalTemp dataset from 1998-2017, we are not able to provide meaningful ratios on a monthly or annual basis because the prevalence of cold records is much smaller than the frequency of warm records (see graph below). In fact, there were no cold monthly records for any grid cell in all of 2017. However, over the full 20-year period, we can say that there were 21.8 times as many warm records as there were cold records. The percentage of the globe experiencing extreme monthly temperatures has averaged about 6.8% for warm records in any given month from 1998-2017, whereas for cold events it has been only 0.3%. These graphs show the relative percentage of the Earth's surface experiencing record warm (red) and record cold (blue) monthly temperatures, by month since 1998. The percentage of earth's surface area experiencing record warmth dwarfs that of record cold in nearly every month during the 20-year period. If the climate was not changing, i.e. atmospheric temperature oscillations were approximately constant over many decades, one would expect that the rate of setting new high, and low, temperature records would slowly drop. The temperature oscillations, and hence the total circulatory energy in the atmosphere, must be increasing to sustain the continuing rate of new records; a well-known property of non-linear oscillatory systems. The rate of setting new daily record highs or lows is related to natural variability (e.g., temperature oscillations), long-term trends, and how many years you analyze (i.e., the period of record). Absent a trend, it is true that relatively stable and well-behaved natural variability would, on average, lead to records being set at a rate near 1/N, where N is the number of years in your period of record. So, for a 100-year period of record, one would expect ~1% of readings to be record highs and ~1% of readings to be record lows on average. So, in theory the rate of setting records would go down over time (as N gets bigger). 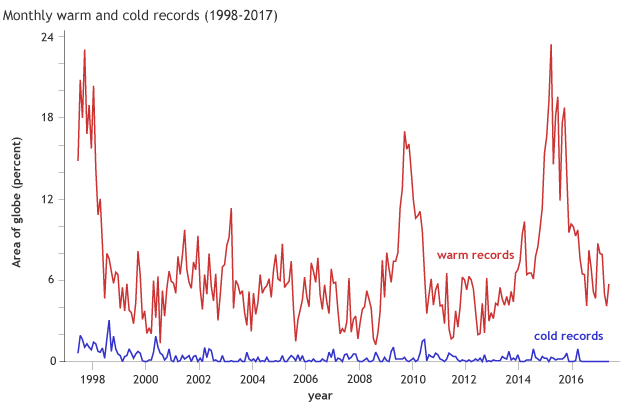 If there is a meaningful trend, one would expect, on average, a greater frequency of cold records versus warm records when the long-term temperature trend is downward, and a greater frequency of warm records versus cold records when the long-term temperature trend is upward. In this analysis, we are focusing on the relative frequencies of warm versus cold records, which is essentially a characterization of climate change (i.e., upward trend) impacts. If we weren't observing a meaningful trend, it would make sense for an increasing rate of setting records (either warm or cold) to be associated with more energetic natural variability. However, that is not the scenario we are experiencing, and at the annual global temperature scales, the natural variability about the long-term trend since 1975 has been remarkably low versus pre-1975 periods. Why do these data only show back to 1998? A 20-year window is relatively small when discussing climate change. Temperature data exist well beyond 1900 and into the 1800's (though admittedly less reliable). Also, seeing a linear (or polynomial) regression comparing means between hot/cold may be beneficial to better understand overall trends in the data. Are the differences we are seeing statistically significant? My guess is a resounding "Yes"! For the global record analysis, we utilize a time period from 1951-2017 because the spatial coverage across the globe prior to the 1950s is limiting. The time series shows the frequency of monthly records since 1998 to provide "recent" readings, however the earlier readings are computed as part of the analysis. For example, there were 42% (13%) more cold records than warm records in the 1960s (1970s). No significance testing has been performed (yet), but the statistics do appear to be resoundingly lopsided don't they?